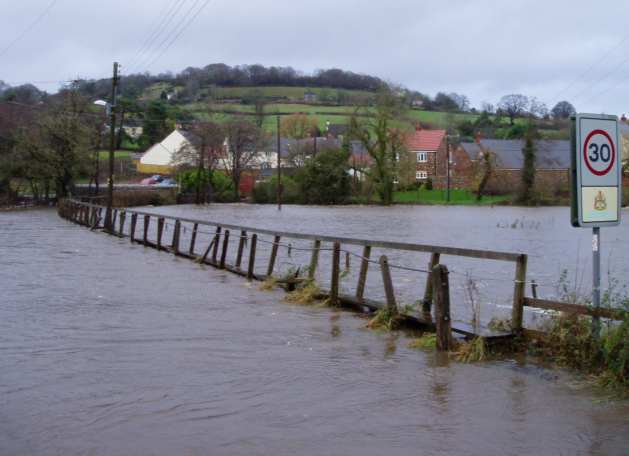 There has been a raised footpath near the Culm River at Hemyock for more years than people can recall. It has meant dry feet for many when the river flooded and its features have been a unique welcome on the road into the village from Wellington. This historic landmark, which has been in disrepair and largely unused for several years, will shortly be replaced by a standard modern footpath on the other side of the road. But what should happen to this familiar sight say Parish Councillors who are seeking the views of local people. Suggestions include scrapping it, fully restoring it as an alternative footpath, or restoring, protecting and preserving a section of the footpath for posterity. Villagers should contact their local parish councillors with their views – but soon as there is only limited time in which to act. Picture – The unique raised footpath at Hemyock due for demolition?